Soon after arriving in Fort de Franc back in December, I’d placed my Nikon D7000 in for a much needed service at a local camera store. The guy said it would be done within a couple of days. This turned into a week, two weeks, then a part was needed. Five weeks later I went into the store and he gave me an apologetic shrug before returning my camera and money. Obviously the part didn’t come in! To make matters worse, my smaller Olympus Tough camera died back in the Tobago Cays (note to readers, I don’t recommend the Olympus Tough’s with the selfie screen – they eventually stop working). So now I am down to my iPhone for taking photos. In Fort de France, every other day or so one or two cruise ships sneak into the bay docking either right in town at Pointe Simon or at the Quai des Tourelles just outside town. The main waterfront road is Boulevard Alfassa which runs from Fort Saint-Louis to Pointe Simon. For the sailors, there’s supermarkets, laundrettes, and other places to provision in FDF. If you walk thirty minutes west along this road you’ll eventually arrive at the large Hyper U supermarket (they seem to have the best selection of meats). Within the city though are Carrefour at the aqua coloured Cour Perrinon commercial centre or the less glamorous Leader Price opposite Sea Services. A block behind Sea Services is the Laverie de la Pointe where you can wash a load from 7 euros. Very handy for yachties. Further north of town along Ave. Jean Jaures you’ll find plenty of hairdressers which seem to be more reasonably priced than those closer to the tourists (I had a trim for 10 Euros). Throughout the town are plenty of cheap clothing stores, and heaps of shoe stores – you can smell the polyethylene as you walk by! Of course there are lots of patisseries, boulangeries, and an horlogerie (clock shop). Here I found a new clock movement for our ships clock which had died. There is the covered market Marche Couvert, which sells touristy stuff and some veggies, but there’s a better veggie market up on Boulevard General de Gaulle – the Lafcadio Hearn Market. Up the hill behind this market is the Calvaire Chapel with great views of the bay. 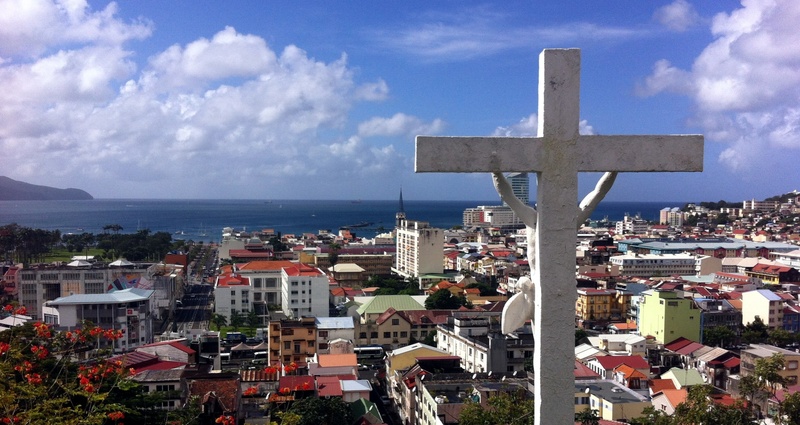 Here are some iPhone photos from around Fort de France. View of Fort de France from waterfront. St Louis Cathedral in background. Fort de France anchorage and surrounds – swings at the foreshore; anchorage at Fort de France, Pointe Simon, statues including a headless Josephine (apparently they don’t like Napoleon’s woman very much as she helped to reintroduce slavery). 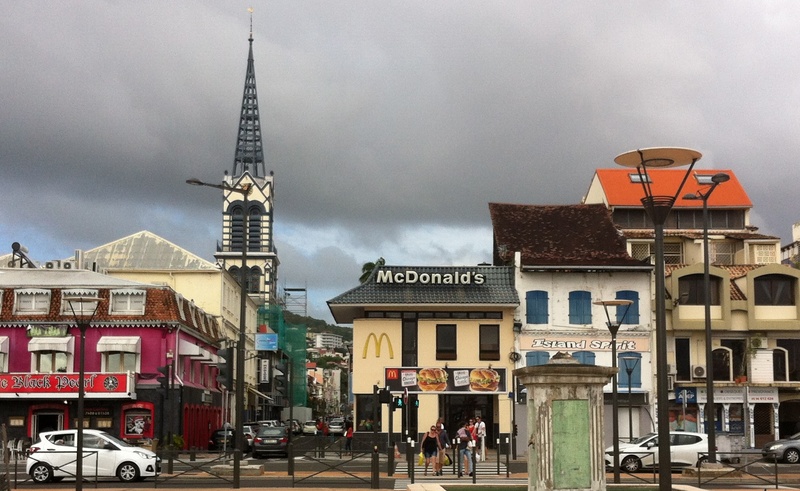 On the street – walking around the streets of Fort de France offers some delights not only in street names, signage, murals, old and new architecture, but also the sounds, smells and people of this interesting city. Aside | This entry was posted in 2016, Martinique, Windward Islands and tagged Caribbean. Bookmark the permalink. Nothing wrong with those iPhone photos!